Minnesota Timberwolves guard Zach LaVine has retained his title as he won the NBA All-Star 2016 Saturday's Slam Dunk contest held at the Air Canada Centre in Toronto. 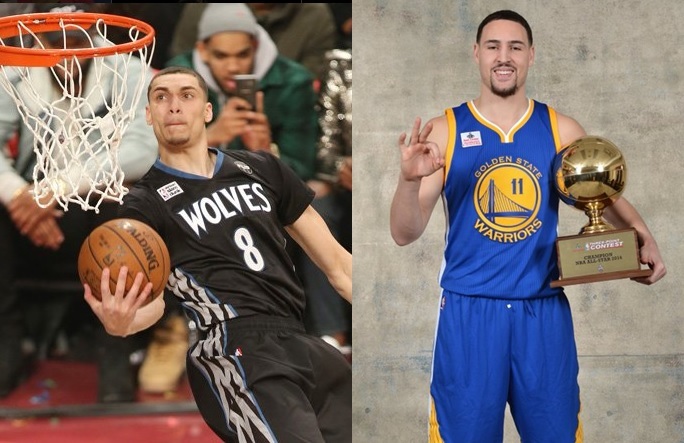 Zach Lavine (left) retains NBA Slam Dunk title; Klay Thompson (right) wins 3-point Contest. While LaVine, who won MVP at Friday’s Rising Stars Challenge, is still pretty raw as a player, he has established himself as the NBA‘s best dunker. "I dedicate this dunk contest and the trophy to my late coach, Flip Saunders and the Saunders family. He's the one that always believed in me and drafted me! We all loved Flip and his memory will live on forever!‪#‎loveyacoach‬ ‪#‎2016dunkchamp‬," LaVine shared on Facebook. LaVine goes behind-the-back then throws down the one-hand reverse jam for his first dunk. LaVine soars through the air and throws down the alley-oop from the free throw line for his second dunk. Gordon finished second in the 2016 dunk contest. Watch Gordon's 2016 dunk shootout highlights here. Meanwhile, another highlight of the All-Star Weekend is the 3-Point Contest. Golden State’s guard Klay Thompson finished with 27 points in the championship round, ahead of Warrior's Steph Curry (23 points) and Phoenix Suns rookie Devin Booker (16 points). "He's the best shooter I've ever seen, so this is a rare occurrence that he loses," Thompson said of Curry "So I'm just happy I caught him on an off night." In last season's event, Curry beat Thompson and Cleveland's Kyrie Irving. Houston's James Harden, Los Angeles Clippers' J.J. Redick, Milwaukee's Khris Middleton, Portland's C.J. McCollum and Toronto's Kyle Lowry were eliminated in the preliminary round. On Monday is the battle of East and West as the 2016 NBA All-Star game, Kobe Bryant's last, will tip-off. Coverage via ABS-CBN Sports and Action will start at 9:30 am. Aside from the All-Star Game, defending champion Golden State Warriors will be featured on two marquee matchups as they take on the Los Angeles Clippers on Sunday, February 21.